The OpenStack Foundation asked the community and the commuity has spoken. Ubuntu is the choice for OpenStack. 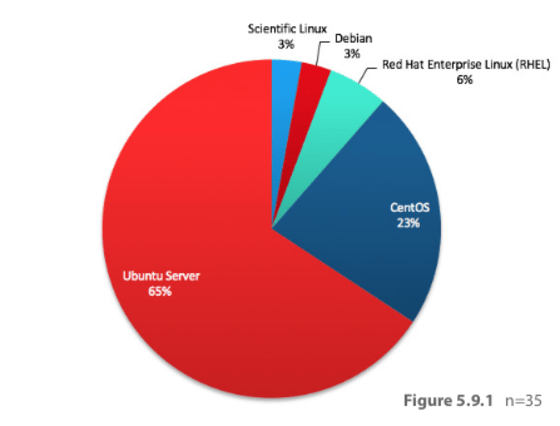 The numbers don’t lie – Ubuntu leads in OpenStack and continues to gain momentum. Over 51% of all OpenStack clouds are based on Ubuntu Server and in large scale production OpenStack clouds with over 1000 users, Ubuntu represents over 65% of the installations compared to 23% for the next most popular option. As those interested in cloud will already know, this week the OpenStack Summit is taking place in Tokyo. Modelled after the Ubuntu Developer Summits of a few years ago, the OpenStack event brings together community comprised of users, developers, vendors and integrators all striving to celebrate OpenStack successes and help shape the path for the next version of OpenStack, Mitaka. In the run up to the Summit OpenStack users are surveyed to try and gain greater insight into what they are doing with OpenStack, the stage of deployments, workloads running and technology choices they are making. The results are always interesting and as a vendor striving to deliver the simplest, most scalable, most economic and highest performing OpenStack available it is an important imput into or development process. The results from the survey released just this week show we are on the right track: Ubuntu has increased its lead by over 10% as the platform for OpenStack in last 6 months. Ubuntu now runs over double all the other technology platforms combined and in large scale clouds, it is nearly 3 times the nearest competitor. The team at Canonical that helps bring Ubuntu Server and Ubuntu OpenStack are incredibly proud of this achievement, user validation is the metric that counts. Others pick stats that suit their purpose – Vendor X may contribute more lines of code, Vendor Y may invest more dollars but Canonical and Ubuntu works smart and the end users like it.